The day started with a search for coffee beans, which we were plum out of, and continued on with thanks to my mother (and Santa) for packets of ground coffee that were in the cupboard. (Big sigh of relief.) So, I'm working on ridding myself of the initial irritation* of "NO COFFEE?????!!!!!" and realizing the high humidity (despite being in an air conditioned house) is contributing to my general feeling of being a major crabbypants this morning. I am SO ready for nice lower temperatures and lower humidity. Next on the list (after I finish my coffee) is heading into Madison for cat litter that isn't perfumed to the nth degree and some cat food that Blue will only eat (roasted chicken flavor Max Cat) with a stop at the Woodman's for laundry detergent for high efficiency washers. My Pig carries a lot of excellent stock for a small town store (including Eight o'Clock coffee beans) but not the larger containers of detergent, so into Madison I go. Perhaps I'll find some happy pants when I get there. Dear readers, I realize this is far from an interesting post but I have to (re-)start somewhere. dumped the whole raised starter, about two cups, into the bread recipe rather than just one cup. probably added another cup of flour (because of the additional starter) to get dough with the right texture but not too dry. Actually, it was wetter than a dough I would have kneaded on the counter. raised the bread dough in the refrigerator overnight. I set it on the kitchen counter for an hour then into the cold oven with the light bulb on to bring the dough to room temperature. Baked the loaves at 450F for 38 minutes and added about a cup of water to another pan under the bread stone at the beginning of the bake time. I had several questions in the comments a while ago about why I walked out of the Mannheim Steamroller Christmas concert at the Verizon Center in DC. I sat through the first half. There was some music and a bit of a light show but most of it was what I consider preaching. Preaching about being good to your fellow man and what ever else. The vocals/preaching were not attractive and they droned on and I didn't get any thrill from any of the music. In fact, I believe I dozed a bit. It was blah. I decided to cut my losses and leave at intermission. I just expected to hear more music....well-performed music and vocals, considering the price of the ticket. I don't mind if people preach but if they want me to pay them to do it, they darn well better disclose that before I buy the ticket. I will not attend any more concerts by this group nor will I purchase any more of their music. Yup, I am annoyed. I have nothing organized for a post so today is random. I have a FO! The Simple Yet Effective Shawl is finished and blocked. Here it is unblocked. There are a few errors that I didn't see when it was on the needles. No, I'm not going back to re-knit although the make-it-right/overly uptight/do-it-right-or-don't-do-it part of me wants to do some ripping. This project was started in a northern winter compounded by unhappiness and depression. I'm not going to revisit that. If I do, I may just stop knitting all together and thus perhaps blogging and I really don't want that. But aren't the colors pretty? Yes, a vacation may be is a good thing. Perhaps some good food and mood-altering substances, too. There may be some sighting of it modeled, if Carrie will help me out this weekend. Yes! Carrie and, hopefully, other friends will be at the Taos Festival this weekend and so will I! Wilson and I are making a long vacation of it and will be adventuring in a place we haven't visited before. Outside of the Festival, we have no firm plans except to enjoy ourselves. The weather has turned quite chilly here in Wisconsin and there was a frost warning last night. The boiler is on and my hands are freezing. The basil near the house survived so I hope there is some fresh pesto in my future. I need to find my fingerless mitts. For travel knitting, I have a sock to knit that I was knitting back at the beginning of July for Wilson. I'm still deciding on the other projects to come along. I may try to revive my Forest Canopy before I go back to Icarus. I was spreading out the Simple Yet Effective Shawl (in progress in Noro Sock yarn) in preparation for a photo and Wilson asked me what I was knitting. When I replied that it was a shawl and would probably be a smaller rather than larger one, his comment was "Really? It looks like a woman's undergarment to me." O.o After some study, I do see some resemblance and it just goes to show it is all in a person's perspective. Last week's hole was fixed using Cookie's advice and now I can't even tell where it was. Thanks, Cookie! I would like to meet and speak with the brilliant engineer that designed those toilets that flush while you're still sitting on them, with no action on your part, except perhaps leaning down or over to perform actions that women perform in a restroom. There are a few things I would like to tell him. Don't ask me why, but I really think it is likely that my use of "him" is correct. I just purchased some barrettes that immediately broke at the hinge. Argh. I'm using these hair devices as my humidity defense while growing out my bangs. I want to go back in time to the 80's so I can purchase some decent barrettes and hair combs, again. Don't let me color my hair again. Highlight, maybe. Color, no. Humidity + damaged hair = big mess. I tried posting this week from my iPod Touch but something ate my post between my hotel room and the Innernets. I didn't walk the Mall this week but I did walk to and from Trader Joe's on Monday and spent some time on the treadmill later in week due to all the rain and thunderstorms. I need to get on the treadmill more often. Wilson and I are having pork carnitas or fajitas or whatever you call them this evening with freshly made pico de gallo. Yum. Surprise! Here's a little knitting content. The first footie is ready for grafting. There is a heel there, just hidden on the back side of the sock. For the observant reader, yes, that is my kitchen table. I drove home mid-day to help DH with any potential problems (with the blessing of my supervisor). I just couldn't leave him to deal with it all. I'm glad I did. The dark green on the screen in the photo indicates areas of rainfall exceeding four inches yesterday. Our house (and a good portion of Wisconsin) are in that area. We were up until 3:30 AM or so with the rainwater in the basement. Although my ancient Safari and TypePad are conspiring to eat my posts, I'm going to post, despite the crabbiness. Now, deep breath *in* and *out* and *in* and *out. * There. This photo was taken only with my 3x zoom. 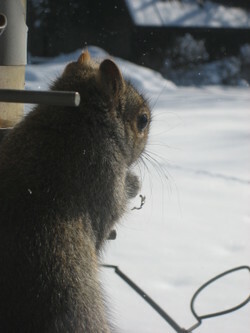 We have our squirrel bird feeders located close to the house to minimize bird/window collisions. It gives us many opportunities to observe birds, squirrels and the occasional raccoon up-close and personal. Yes, Purling Oaks has a squirrel theme lately. Is there a problem? I'm still recovering from the cold virus. (You think?) 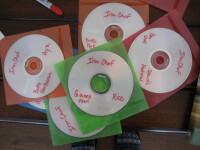 Yesterday I burned a number of Iron Chef episodes to DVDs from our DVR where they've been residing for about 10 months for the oldest. FoodTV was airing the episodes for the past several years but have stopped showing the original Japanese series. DH and I really enjoy the original series and (are you listening episode-owners?) we would love to buy a commercial-free set of episodes. 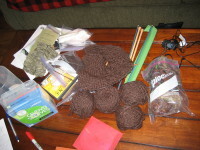 I also took the time to clean out my Williamsro knitting bag that also has served for a carry-all. Charging cords for the new and old mobile phoes, charging card for the Ninetendo DS Lite, sock needles, straight needles-sizes 10, 10.5, and 11; hygiene products, pattern, Koigu fingerless mitts, Handwoven magazine, Cash Iroha yarn (brown)-four cakes + two used (yarn worked double), two skeins of Blossom, and the Willliamsro sleeve in process. How did that all fit in there? No knitting progress to report. However, the handles for the Fuschia Felted Bag arrived today via the Big Brown Truck! Hurray. Perhaps I'll be posting about a finished object this weekend. The past few days I have been feeling twinges of the approach of the winter blues. I'm doing my best to ignore those twinges but I'll have to take care to keep those blues at bay. One of the successful techniques is to eat well. Tonight, I made Chicken Tikka Masala. There are as many versions of this dish as there are cooks. This spice package and recipe are unique in my experience of the dish because of the inclusion of a half-cup of minced fresh ginger. 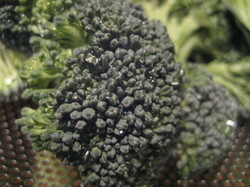 I also like to add green vegetables, sometimes suger snap pea pods or, like tonight, broccoli. DH made the fragrant rice by including a few whole cloves, a bay leaf, ground cardamom, a few saffron strands, and a cinnamon stick in the rice cooker. 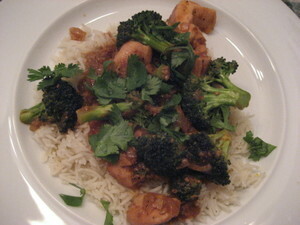 To serve, I start with rice on my plate, then the tikka masala, then some chopped cilantro leaves. The flavor in this meal just keeps improving as you eat it. If you enjoy curry, you know what I mean when I say the last bite is the best. My theory is that the spices are mildly addictive. Tuesday we are expecting another few inches of fresh snow.....maybe four inches by Tuesday evening. I wonder if I might be able to use my snowshoes soon. Red aluminum tubing snowshoes. Very fun. I'm reading everyone's comments, really. I'm just woefully behind in answering emails. Thanks for commenting!